On the afternoon of May 9, 2018 local time, Premier Li Keqiang held talks with Prime Minister Shinzo Abe of Japan at the State Guest House in Tokyo. Li Keqiang expressed that China and Japan are important and close neighbors as well as major economies in the world. The healthy and stable development of bilateral relations is related to the well-being of the two peoples, and also to the peace, stability and prosperity of the world, especially to that of Asia. China-Japan relations had experienced twists and turns and gone through a detour over previous years. Recently, Japan has released important and positive information on its relations with China, and there has been a sound momentum of improvement in bilateral relations. My visit this time aims to work with Japan to jointly bring China-Japan relations back to the normal track. I also hope that the two countries can meet each other halfway, and strive to maintain the long-term, healthy and stable development of relations between both countries. Li Keqiang stressed that this year marks the 40th anniversary of the signing of the China-Japan Treaty of Peace and Friendship, which has affirmed various principles of the China-Japan Joint Declaration in the form of law, and clearly put forward the development of ever-lasting peaceful and friendly relations between the two countries. No matter how the situation develops and changes, the two sides should abide by all principles set forth in the four political documents between China and Japan, safeguard political foundation and properly manage and control contradictions and differences based on the spirit of taking history as a mirror while facing up to the future, so as to jointly open up the future of bilateral relations. The Japanese government and leaders have repeatedly expressed the willingness to face up to and reflect on history of the past. It is hoped that the Japanese side could fulfill its commitments with practical actions. On the Taiwan question, it is hoped that Japan can honor its promise and stick to the one-China principle. The two countries should jointly maintain the stable and sound situation in the East China Sea, so as to make it a sea of peace, cooperation and friendship. Both sides should proceed from the fundamental interests of the two peoples, adhere to the road of peaceful development, truly regard each other's development as opportunities, and translate the political consensus of treating each other as cooperative partners instead of threats into actions, in a bid to make peaceful coexistence and ever-lasting friendship always become the main melody and the forward-looking direction of bilateral relations. Li Keqiang pointed out that practical cooperation is an important engine and support for the development of China-Japan relations. China and Japan enjoy strong economic complementarities. The two sides should further exploit potential, enhance cooperation in such key areas as energy conservation and environment protection, scientific and technological innovation, high-end manufacturing, finance, sharing economy, health care and elderly care, discuss the "Belt and Road" cooperation and jointly explore third-party market. The two sides have reached principled consensus on the signing of a currency swap agreement. China has agreed to grant Japan the quota under the RMB Qualified Foreign Institutional Investors (RQFII). The two sides should carry forward the tradition of people-to-people friendship, strengthen exchanges in culture, education, sports, media and youth as well as at local level, and further do a better job to make people-to-people bonds get closer. Shinzo Abe expressed that Japan-China relations have achieved practical improvement since last year. Both sides have restarted Japan-China high-level economic dialogue and realized mutual visits between foreign ministers. Looking back over the past road and looking forward to the future, Japan will stick to a peaceful development path, and is willing to take Premier Li Keqiang's visit this time as an opportunity to inherit the spirits of the elder generations, continuously improve and push forward Japan-China relations and promote the implementation of the strategic and mutually beneficial relations, in a bid to build a more mature relationship between both countries. Japan is ready to, together with China, enhance political mutual trust, maintain high-level exchanges and strengthen communication and coordination on international and regional issues. Japan will only maintain non-governmental exchanges with Taiwan in accordance with the Japan-China Joint Declaration. Japan supports China's reform and opening up, and is willing to continuously boost bilateral cooperation in key areas, jointly safeguard the free trade system, maintain rules-based, just and open multilateral system, and further expand exchanges and cooperation in such areas as investment, tourism, culture, food, disaster reduction and maritime exploration. The two countries need to jointly carry out cooperation in third-party market, and deal with global challenges together. Both sides also exchanged in-depth views on the Korean Peninsula situation and other international and regional issues of common concern. After their talks, Li Keqiang and Shinzo Abe jointly witnessed the signing of multiple bilateral cooperation documents in such fields as people-to-people and cultural engagement, medical and healthcare, service trade, third-party market cooperation and the establishment of a maritime and air liaison mechanism. Prior to their talks, Shinzo Abe held a grand welcoming ceremony for Li Keqiang at the square of the State Guest House. Shinzo Abe greeted Li Keqiang when he arrived, and then leaders of both countries stepped on the reception stage. The military band played the national anthems of both countries. The national flags of both countries fluttered in the wind. 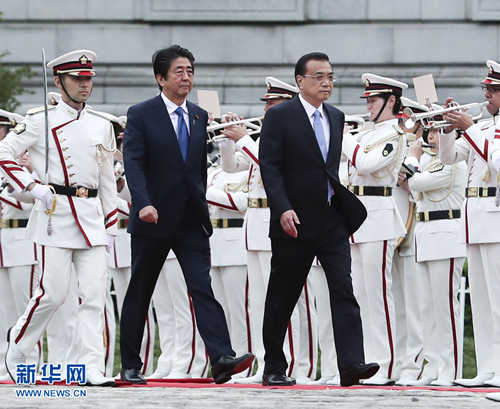 Accompanied by Shinzo Abe, Li Keqiang reviewed the guard of honor. Wang Yi and He Lifeng attended the talks.